Author Written by Harmeet and last updated on Posted on December 21, 2017 . 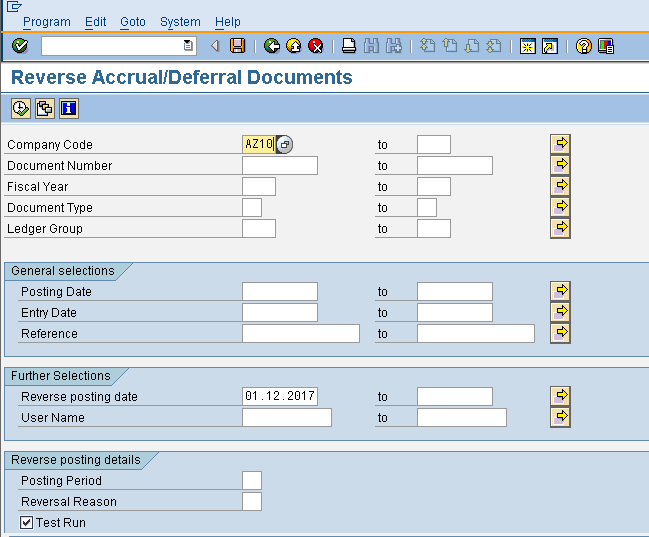 This tutorial which is the part of the free SAP FI course talks about SAP Accrual Deferral Posting. Accrual of an expense is reporting an expense in the period in which they occur irrespective of the payment made. Expenses are reported in the period in which they occur, and that period is prior to the period in which the payment is made. Deferral of expenses means that a payment is made in one period, but the expense itself will be reported as an expense in a later period. In Accrual/Deferral document method, provisions are made on a month’s end and the same are reversed on the next month’s first working day. 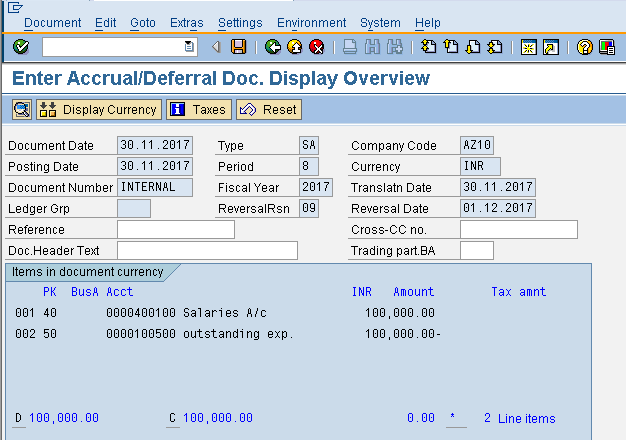 Accounting implication of accrual of expenses can be seen on the following example. Suppose that we make a provision for rent on 23.11.2017 and reverse the same on 01.12.2017. Now, suppose the actual rent is paid on 05.12.2017. Negative posting: Check this indicator. When we reverse a transaction, it will be shown at the same side instead of being shown on the other side. For example, if we reverse rent provision on 01.12.2017, it will be shown as the negative balance on the debit side instead of credit side, so that the net effect is zero. Alternative posting date: Check this indicator. 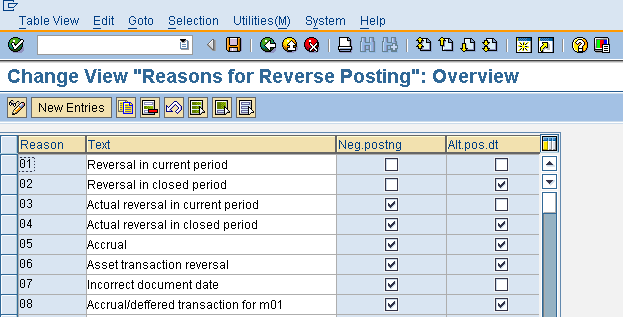 If we do not select this, the system allows us to reverse document only on the original posting date. If this check is selected, it allows reversal entry on any date. We will post a normal provision for rent by using FBS1 transaction and we will give a reversal reason and a reversal date. 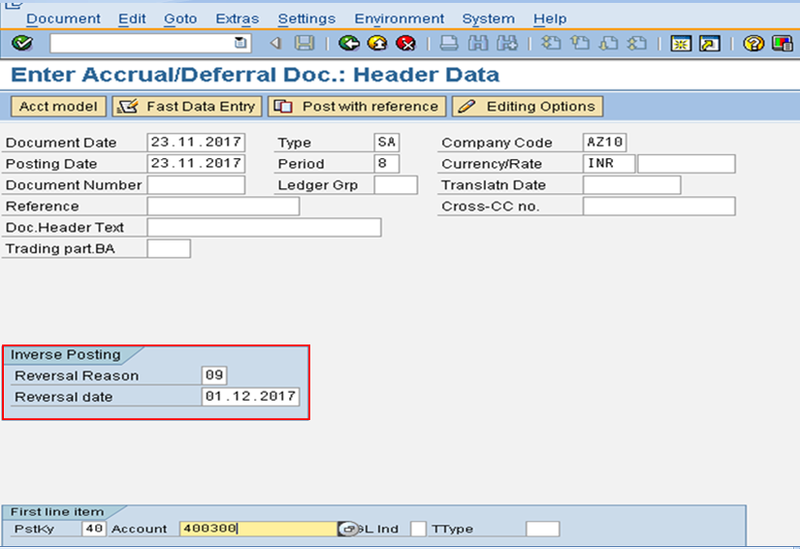 Document is posted on 23.11.2017 and is reversed on 01.12.2017. It means that provision of rent is made on 23.11.2017 and the same is reversed on 01.12.2017. This activity is a part of month end provisions in any company. Enter Reversal Reason as 09. In the next screen, enter the amount of provision to be made and text. Now, post the transaction. Below is the document posted. Rent account will be debited and outstanding expenses account will be credited. We will post one more transaction for provision of salaries on 30.11.2017. 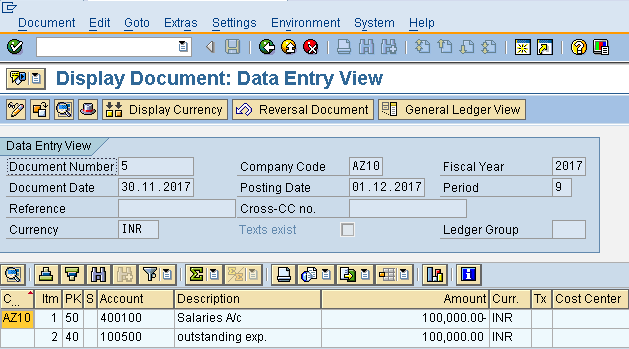 Salaries account is debited and outstanding expenses account is credited. Now, we will reverse the rent provision and salaries provision by entering transaction F.81 in the command field. 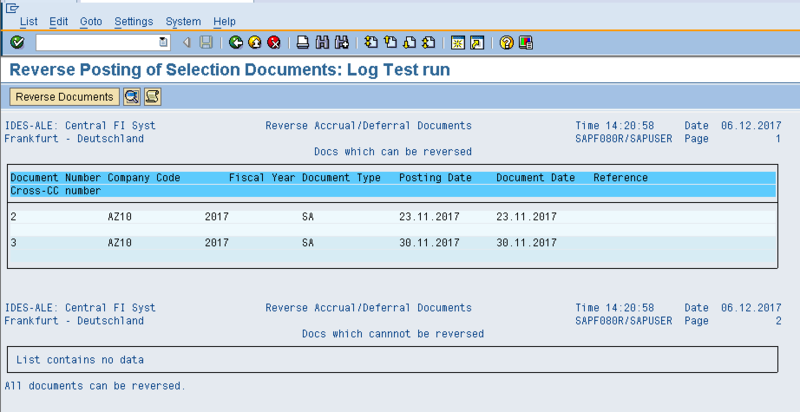 Then, we will enter company code, reverse posting date, check test run and click on execute button. 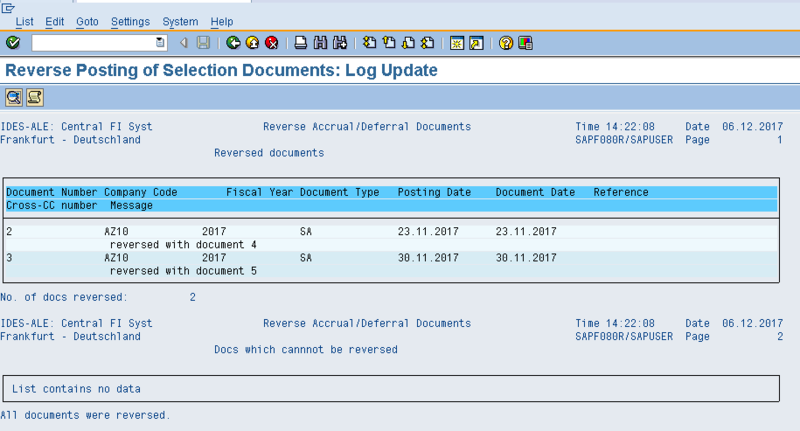 After this, we will click on button and the SAP system will show a message that the document has been reversed like shown below. Document #2 (rent provision) is reversed with document #4, and document #3 (salaries provision) is reversed with document #5. 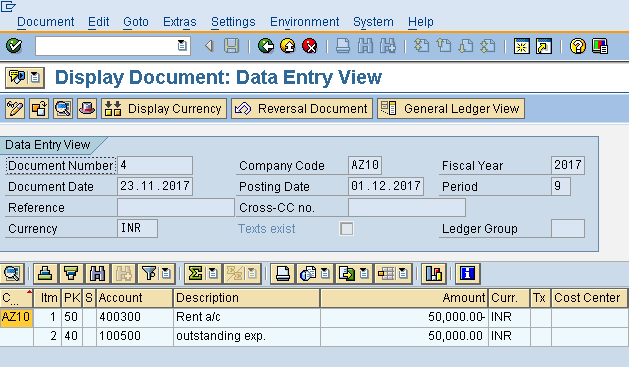 We can also view the reversed document by using transaction FB03 (Display Document). The rent account is credited and the outstanding expenses account is debited. Similarly, the salaries account is credited and the outstanding expenses account is credited. 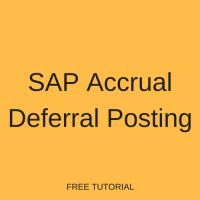 I hope this tutorial gives you a good understanding of the concept of SAP accrual deferral posting. Its simply superb. Thank you .And if possible give more explanation on FI month end activities. 3 Run Business Area’s Assignment report. 25 Update current cost price to material master price field. In this way we are not charging the rent in December.. Please correct me if i’m wrong. To make my above question simple. 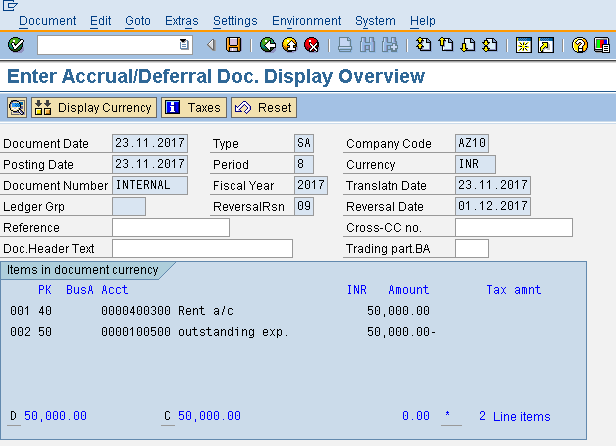 is it compulsory to make a reversal of accrual and deferral expenses in SAP or we can use the method that i mentioned in above Question? 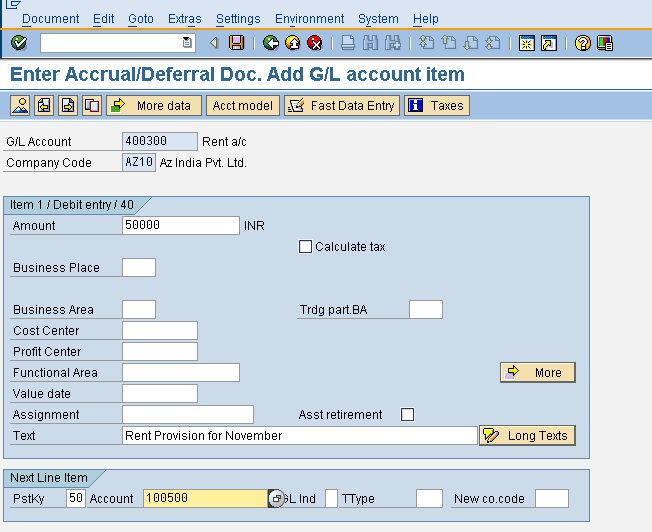 Accrual is accumulation of expense items until it becomes due for payment. Mere creation of provision will not help…as it comes under operating costs. Thus we need to reverse it and thereafter it is paid in the next month December. Rent for the Month of Dec 2018, will be paid on or before 15 Jan 2019. The Entry will be executed in the books on Jan 15, 2019 (Actual Payment) But as the said rent is for the Month of Dec 2018, it is due to be payable on 31 DEC 2018. As part of Period end closing. 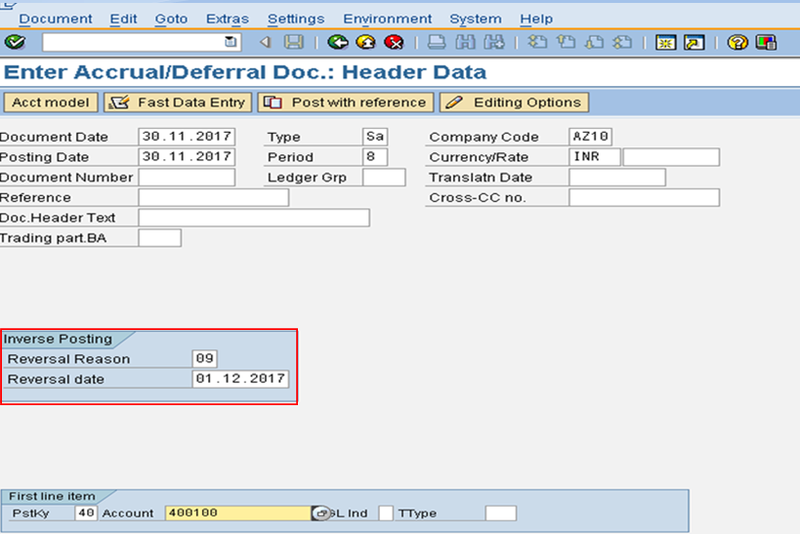 An entry is executed on 31st Dec & the same is Reversed on 01st Jan 2019. Actual Payout is posted, as on when basis.